If you’re still complaining about the Subaru BRZ’s lack of turbo, you probably don’t quite understand how Subaru–with help from Toyota–developed this sports car. From the beginning, the point was to save as much weight as possible, and that doesn’t change with a 2017 update. Subaru has given the 2017 BRZ its most substantial update since it was introduced five years ago, amping up what’s best about the car while turning down the nannies. It’s also introduced a Performance Package that upgrades what the brand views as important. Hint: that isn’t power. This is because, in its current form, the BRZ isn’t about straight-line speed; it’s about handling. To prove this point, Subaru invited Motor Authority to Granada, Spain to drive the updated 2017 BRZ with the new Performance Package on city streets, up twisty mountain roads, and around the Circuito Mike G Guadix. As a refresher, for 2017 the BRZ gets some notable enhancements all around. From full LED lighting both front and rear to a new front bumper that gives the car a wider and lower look, it’s just better looking. The headlights now have “BRZ” lettering on them, because everybody’s doing that sort of thing these days. At the back, there’s a new aluminum rear spoiler that’s thinner and lower, and also serves to improve stability over the 2016 model. Inside, Subaru swaps in a new steering wheel, which now has audio switches and controls for the available 4.2-inch color gauge cluster display on Limited models. New knee pads on the sides of the instrument panel protect the driver’s knees during hard cornering–a feature I appreciate. The infotainment’s been upgraded as well, with a Magellan navigation system–which requires a subscription–along with an app to help find the best parking spots and compare rates. It works with the Yelp and Glympse apps, the latter of which gives you the ability to share your location in real-time with others. The most typically Subaru addition? An app called eBird, which tells you about local bird sightings and locations. Can’t even make this stuff up, folks. It’s more appropriate for the Outback, but Subaru has brought it to the BRZ. Subaru hasn’t forgotten the most important aspect of the BRZ: how it drives. The front springs are now a smidge stiffer for better handling on turn-in while the rears are 10-percent softer for better stability. A 1 millimeter thicker rear stabilizer bar means ever-so-slightly less body roll, and the dampers have been retuned in the name of comfort and handling. These are all small changes, but the single largest change involves the software. The stability control system thresholds have been raised, and not by a little. With all the systems on, the nannies come in latter, and the stability control’s Sport mode has become a Track mode that takes its thresholds to a whole new level. 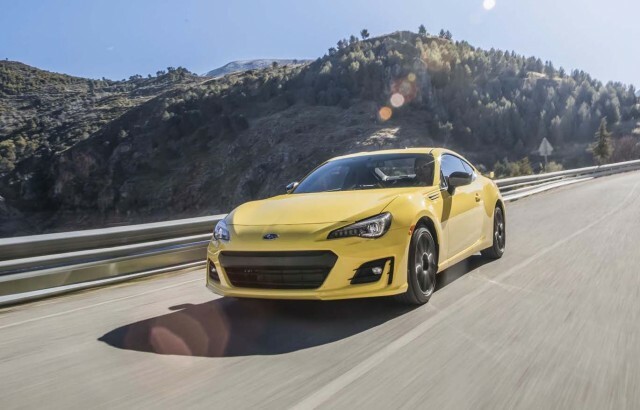 Manual equipped cars–which account for 83 percent of BRZ sales–get a very small bump in output for totals of 205 horsepower and 156 pound-feet of torque. The increases of 5 horsepower and 5 pound-feet of torque are thanks to an aluminum intake manifold replacing the 2016’s plastic intake, a new air cleaner box and intake towers with 30 percent less resistance, a low-friction finish on the camshaft journals, and revised fuel pump cam lift. The valve stems are buffed and polished and the rocker arm pivots are revised. Subaru also uses stronger pistons and a larger diameter exhaust manifold with a revised collector shape. Finally, the final drive ratio on manual transmission models has been lowered from 4.1 to 4.3:1. The BRZ’s body is stiffer than before thanks to a thicker bracket behind the strut tower braces, a thicker transmission crossmember plate, and new reinforcements at the rear wheel housings. The goal with the updates was add a bit more comfort, make the safety systems less intrusive, improve handling, and raise the bar for fun.